ANNA RETURNS TO THE SHRINE ! Singing her popular rendition of THE DIVINE MERCY CHAPLET daily and cantoring Masses with Br. Ken Galisa. Join Anna & Fr. Greg! Fr. Greg is the Pastor of Holy Cross Church in Bay City, TX. Print/mail last page of this flyer to register by June! Anna Nuzzo hosts this monthly program featuring amazing church choirs: their personal stories and beautiful music! Tune in to shalomworldtv.org to watch many faith-filled programs! singing at St. Peter Basilica for Epiphany Vigil Mass, attending the PAPAL Epiphany Mass Celebration, singing at Holy Family Church, Palestrina, for Epiphany Mass, singing for Mass & Concert at the Sanctuary of the Eucharistic Miracle in Lanciano, and more! 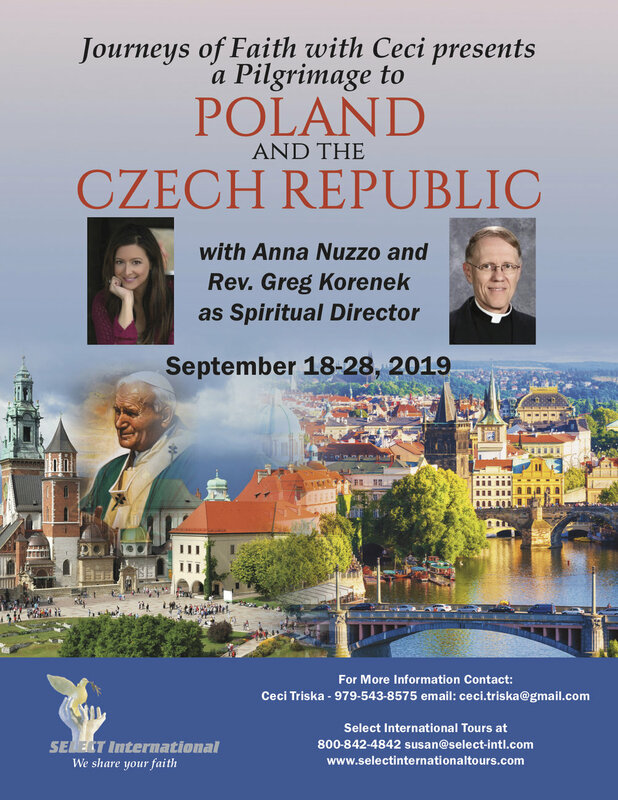 Visiting Rome, Assisi, San Giovanni, Pompeii, Lanciano, the Amalfi Coast & more..
Brought to you by Journeys of Faith with Ceci through Select International Tours! "How to deal with loss over the holidays"
"Through the Eyes of MARY"
Catholic Familyland in Bloomingdale OH. This special Mass consists of all songs by Anna Nuzzo..
many of her other Christian songs! Contact Fr. Edward Looney for details..
Anna and her teenage son Luke. LIVE for One Hour Radio Show!